Since 2005 I’ve been a committee volunteer with the Maasai Cultural Exchange Project (MCEP), a non-profit group under the umbrella of Frog Pond Productions, a 501(c)(3) educational organization in Point Pleasant, Bucks County. We advocate for a Maasai tribe located in Kenya, East Africa. They receive support from Americans in Bucks County and surrounding areas who sponsor children’s education and donate funds for water well projects. This success is due to MCEP’s partnership with an NGO in Kenya: The Simba Maasai Outreach Organization (SIMOO). In February 2015 I traveled to Kenya with two other volunteers for a fact-finding tour. One of the sites on our itinerary was a trip to the Oloshobor Dam, shown above. 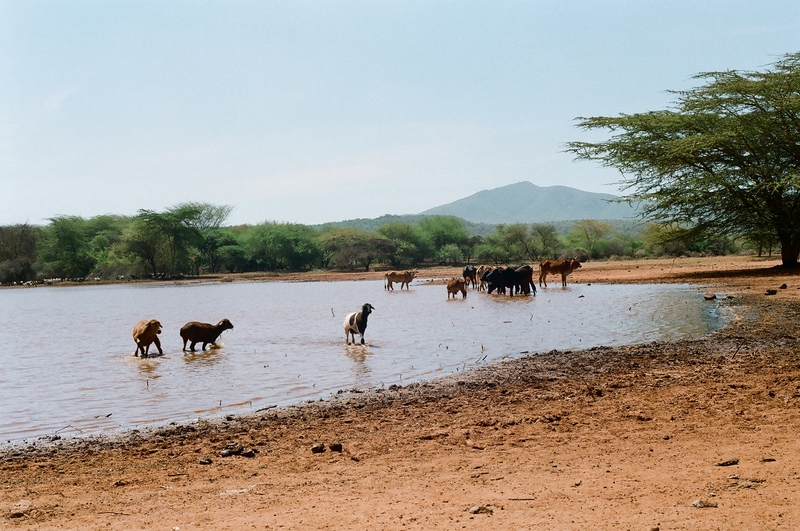 Every day herders brought their livestock to drink the water. On this particular day we sat along the bank above the dam. With the sound of livestock splashing in the water, we cherished this time watching herders as they took turns leading their goats and cows to quench their thirst. The Maasai is an indigenous tribe that from one generation to the next passes down awareness of their environment. They live with a “Dry season” and a “Rainy season”. In conversations with them they are most concerned about the fluctuations that have occurred to these two seasons. The “Dry” season is extending by months; the “Rainy” season has almost ceased to happen. Two weeks ago we received an email describing the dire situations brought about from this extended drought. 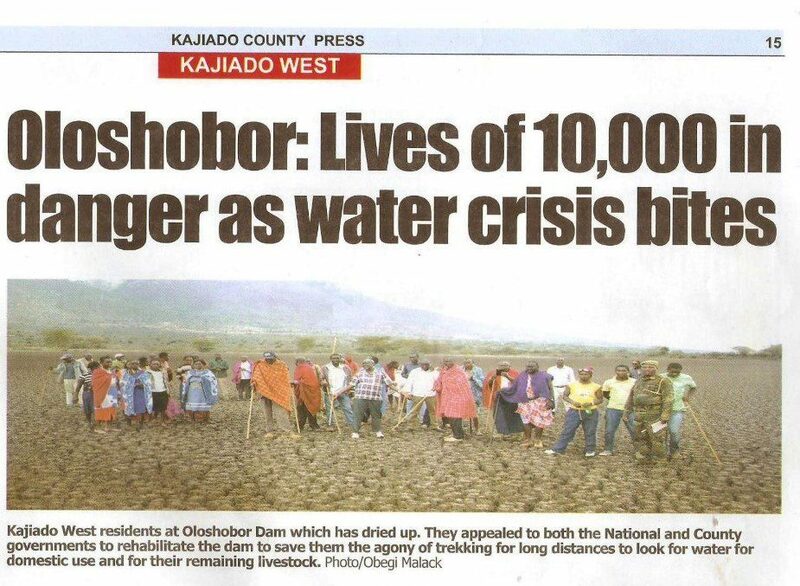 In this newspaper article from February 2017 this parched land on which they are gathered is a similar dam to the one I photographed in 2015. Both of these dams are now dry. Fortunately MCEP’s seven wells sited across their village, have quenched the thirst of 5,000 people and their livestock. Funds from donors also helped to install pipelines at the wells that snake across the terrain to cisterns located throughout the village. As the land dries from the drought, these seven wells with potable, disease-free are saving lives. The Maasai attribute these extended droughts to climate change. Water has become so precious that an emergency decision was put in place. Water for the most vulnerable is the priority. As important as livestock is to the Maasai, they’ve made the decision that the elderly and the youngest will have priority for water. Many areas of the African continent have already morphed into desert-like landscapes because weather patterns are no longer “normal” to what many of these countries experienced in the past. Populations in other parts of Africa are dying because there is a lack of potable water. In Kenya’s Rift Valley the people are eating poisonous plants and their livestock are dying. This severe change in Africa’s weather cycle is happening around the globe, even here in America. As I write this the United States Senate is debating whether or not to place Scott Pruitt as Secretary of the Environmental Protection Agency. Pruitt does not believe in climate change. Earlier this week Doylestown citizens packed the regular meeting of the Central Bucks School Board after learning the board was considering adjustments to text books regarding “climate change”. I am a product of the Central Bucks school system from Grade One through Twelve. I thrived in an atmosphere that encouraged the pursuit of knowledge. I’m disappointed that the Central Bucks School Board may have members elected to that body who dismiss science and/or climate change from the curriculum. The tinkering of climate change is not exclusive to the Central Bucks district. Across America elected school board members approve text books with suppressed or altered facts related to science, culture, history, geography and others. School boards have the power to shape our children’s minds. Yet when election cycles for school board candidates are scheduled, the voter is MIA at the polls. Who is running for school board in your community? An Act amending Title 18 (Crimes and Offenses) of the Pennsylvania Consolidated Statues, in abortion, further providing for definitions, for medical consultation and judgment and for the offense of abortion on unborn child of 24 or more weeks gestational age, providing for dismemberment abortion ban and further providing for reporting. Italics mine. I got an alert about this anti-abortion bill in early February. It was assigned to the Judiciary Committee. The bill comes under a Crimes and Offenses statute, suggesting criminal prosecution against an “… unborn child”. In her Senate Co-Sponsorship Memoranda dated December 22, 2016, Senator Brooks wrote of the bill: ” … the legislation would prohibit the practice of tearing a fetus apart by its limbs, also called dismemberment abortion.” Brooks proposes to reduce the maximum gestational age to 20 weeks. (Italics mine). Since getting the alert on SB3, on February 8 the PA Senate passed it 32-18. It now goes to the General Assembly where during last year’s session a similar Bill was approved. The General Assembly will not hold public hearings. Now a compromise bill will be voted on, probably approved and sent to Governor Tom Wolf. Currently 15 states are legislating similar reduction of the gestation procedure to 20 weeks. Ohio Governor John Kasich (R) on December 16 of last year signed into law such a ban on abortion after 20 weeks. With this latest anti-choice bill, legislators opposed to abortion are creeping toward a law that could ultimately change the term “fetus” to “human being”. Thanks to Science–a word not recognized by extreme conservatives–“Life” as championed by V-P Pence at that March for Life rally might encourage some lawmaker to introduce a bill that a Human is conceived when a wiggly sperm joins with a ready egg. This unexpected divine praise pairing Conception and Science by anti-choicers brings me to contemplate these additional thoughts. Conception Legislation can determine (with nearly 100% accuracy) the date when “… life begins …”. Conception Legislation can also–early in a pregnancy–determine the gender of a fetus. Conception Legislation would then require a Certificate naming the “Human”. Additionally, Conception Legislation would require a Social Security number be assigned to the “Human”. Conception Legislation would further allow coverage of medical insurance for the “Human” (think in-utero surgery). Last week I called my State Senator, Chuck McIhinney (R-10th SD) to express my concern about no hearings. I applaud Senator McIlhinney for voting NO on SB3. The other Senators representing parts of Bucks County voted YES: Robert M. Tomlinson (R – 6th SD); Stewart J. Greenleaf (R-12th SD); and Bob Mensch (R-24th SD). Reader–please ponder: At future celebratory parties could families and friends be singing “Happy Conception Day” instead of “Happy Birthday”? Will parents now share that moment of conception instead of those heartwarming and sometimes dramatic birthing stories? I remember both times when my son and then my daughter slipped out of my body, sucked a mouthful of air into their lungs and became living human beings. Can’t remember those two times when a wiggly sperm met a ready egg.